"I'm living and working in the Netherlands,living in the village of Zeist, famous for the Lockerby trial nearby. On the map you'll find it just to the east of the university city of Utrecht. Zeist is where the scenery changes from flat open fields to woodlands and sandy heaths. Next year I'll have been married to Irene for 25 years. So time for a party! 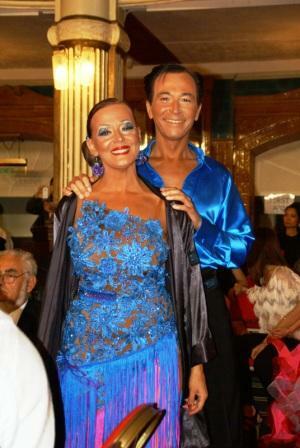 Our hobby is Latin Ballroom dancing and we compete in competitions across Europe. We even have a studio at the end of the garden so that we cna practice from home. We enjoy cooking, wine whisky, musicals. Travelling other than for competitions and visiting the family is a pleasure of the past. Working for Logica NL for more than 25 years, but have spent the last years at Shell in The Hague. Feeling that I've seen it all come round at least twice before. I miss my close friends from the school days. We don't get to meet up all that often, but there is something special about those early friendships that keeps them alive.